I have made a 7 part video series to discuss some factors of tests 17 - 22 and have uploaded them to you-tube. Please note that these files are all available to anyone who wishes to have a copies of them. This includes the Access Application program that I wrote to help analyze the the 100,000 sample data-sets. It is a work in progress as you will see in the videos, but it is available for your use. Also available (see link above by Glen) is the Tektronix OpenChoice Desktop program which I briefly show in Part 7. This program does much more than I demonstrate, but I do not have a scope here right now, perhaps Glen can show some of that when he is able to get another one in the future - soon I hope. If there are any questions regarding these tests please ask Glen as he performed them and I don't even know what his parameters were at that time. If you have any questions regarding these videos or the software I used in this analysis please feel free to ask and I will do my best to answer in a timely manner. Hi Fuzzy thanks for response. I would like to use this heater for water. I tried a silicone to my 10ohm heater to insulate it but it did not heat the water. Maybe I should use a type of glue that insulates the nicrome but transfer heat easily. If you know of such glue Fuzzy please let me know? Yesterday I thought to myself "I wonder how Glen's Resistor compares to this heater I have keeping me warm right here"
So, like Nikola Tesla used to like to do, I set out to determine the surface area of my wonderful 1500W "warmth maker". It is one of those oil based systems, organized in a radiator style. It has 6 complete elements of the same size and one larger element that also contains the electronics and plumbing. it also has two connection cylinders that run the length, one on top and one on the bottom, connecting all the elements. Well after all of my calculations I arrived at a surface area of approximately 14,171 cm². I also have temperature measurements. Surface Temp 169° F and Ambient Temp (taking an average of multiple points around the room) 71° F for a difference of 98° F.
Since Glen's average ambient temperature was 74.2° F, and I am looking for a differential of 98° F, I look up 172° F in the table and find a corresponding power relationship of 8.95W. Now we must spread that out over the surface area of his resistor. His resistor is a 3.2cm x 15.2 cm cylinder with stopped ends (which I take as being thermal insulators, not dissipators) Now there may be slightly more surface area because of the bubbly nature of the Silicone covering, and it has a larger diameter. So how about we add a couple mm for that and the wire thickness? (I think the wire is 0.81mm) So lets say 3.4cm x 15.2cm for a surface area of 3.4 x Pi x 15.2 cm² or 162 cm². 8.95W / 162 = 55.2W / cm² for the same thermal advantage of 98° F.
Right out of the gate, with a DC application, Glen's resistor outperforms my AC radiator by almost double, or actually 192% better efficiency in watts per surface area for a given thermal advantage. This all came about after my explaining COP to an interested party wherein I had used the illustration that follows in my next post. As this illustration goes, a person fabricated a bucket out of wood but the sides did not match up so well and there were gaps. Even after the wood was well saturated, it leaked considerably. Nevertheless, it was needed to move water from the lake to the house, a walk of exactly one minute. The bucket could hold twenty liters when filled at the lake, but when it reached the house it only had 1 liter left. This was the norm, the standard, the baseline for that bucket. One day, the person awoke and thought "I have gauze in my cabinet, I'll wrap that around my bucket". So it was done, and can you believe it? The bucket had 17 liters now by the time it reached the house. That is a 1700% improvement! The person was very happy. But then, a neighbor came by and explained that they had a plastic bucket that would come in with all 20 liters. "Yes, but does your plastic bucket have a 1700% improvement over its norm?" the person asked. "No" replied the neighbor, "there is no improvement, it is the same now as it always has been"
This illustration helps us to see how setting baselines and then demonstrating improvements can still fall short of demonstrating a value to the world. It also causes pause and reflection of the term COP and how it really applies from the global view. I have noticed that some confuse the terms and thought it may be nice to bring some level of definition here. The 'C' in COP stands for coefficient. A coefficient is a constant, a specific value, that when multiplied with a variable gives a result. It is a mathematical term and it is found throughout science. For example, your tires on your car will have a traction coefficient, resistors will have a temperature coefficient, and wood can have a friction coefficient. Unfortunately, some have misread this to say 'Co' meaning shared, 'efficiency'. And it is not uncommon to hear people say it as 'co-efficiency' or even print that in the title or body of their papers and posts. But in reality, it does not have anything to do with efficiency. That is an entirely different subject that should be considered. The 'OP' stands for "Of Performance". Therefore, a COP is a mathematical constant that is used to give the performance result. The global view of this term COP, relates to heating systems and represents a ratio between how much energy is used to move heat from one place to another and the increase in heat at the result location. A person had a pile of money in one room of the house and desired to have it moved to another room of the house. So this person asked a neighbor child if they would use their wagon to move the money. The child agreed, and for this the person rewarded them 1% of the money. Can we say that the person spent 1% and gained 99% ? Not really, because they were just moving around what they already had. But what can be said, is that for a price of 1% they achieved a result of 99% and that would have a COP of 99. So it goes with thermal energy. Heat pumps take from the pile outside and move it to the pile inside. So when we use the term COP we really need to tie it to the global view of what we are moving from where to where. Fortunately, we have established relationships between Watts, Joules and Calories which help us get things right. EDIT: It should also be noted here that we are speaking about volumes, not areas or points. By the way, it would appear that my 1500W "warmth maker" is the leaky bucket. This is a sticky issue and I have been apprehensive to address it for two reasons. 1. If it exists in the MOSFET heating circuit, then our previous tests need to be analyzed in such a way as to factor it into the equations. 2. It goes against normal logic with regards to simple analysis of DC systems. But it is a concern that needs to be discussed and addressed. This is what I alluded to in the other thread regarding being able to light a 100W lamp while showing zero CSR current. Below I have 3 drawings showing 4 different circuit configurations. All of which draw attention to specific current flow factors that hopefully will help us to understand better what is happening in this circuit. Notice in the above drawing that a primary current will flow when either or both of the switches A or B are closed. Notice also that when both are closed, current does not flow in CSR 1. This is not an AC application, all of the signals are DC. But notice, that if we alternate A and then B that the current in CSR 1 will in fact be AC. If we were to put our CH1 scope probe on CSR 1 for that operation, it would mislead us into thinking we have no source power being used while a probe on CSR 2 would clearly show (as would the lamp) that we are using power. Also note the all of the BEMF generated in this circuit is utilized. In this configuration we have removed CSR 2 and allowed the power stage to use CSR 1 for its current path. Notice that we are still using pulsed DC here and in this case we do not alternate A and B, but instead must turn them both on to get a transformation. Also, notice that our transformer has a different turns ratio. By convention, the current flowing in the primary will be the same as the current flowing in the secondary. Notice the configuration for the two current paths as they both route through CSR 1. If we put a scope on CSR 1 what will it tell us? Assuming there is no phase lag in the transformer, will it show any current flow at all? What does this tell us regarding secondary currents being mixed with primary currents in sensing resistors? Notice in the image above we have two nearly identical circuits. Some of you will recognize this as being very similar to the MOSFET Heating Circuit. Notice again that we are working with DC. Because switch B in the left diagram causes an open circuit configuration at the end of an on cycle, no current can flow in CSR 1. This however does not prevent the BEMF from accumulating at its contacts when the inductor discharges. What happens to that energy? It rings back and forth as Alternating Current in the inductor itself until it is fully dissipated. If we put a scope on CSR 1, it will tell us nothing of the BEMF ringing. In the Image on the right, we have replaced switch B with a MOSFET. Now we have introduced two new things that are not present in the left side diagram. First, we now have a current path around the switch in the opposite direction. We also have a capacitive pathway through the gate of the MOSFET into the timer circuit that drives it. Now, when we place a scope on CSR 1 and see a negative currrent, we don't know if it is flowing through the diode or through the gate, or both. What is more, we don't know if it is being sourced by the batteries or by the inductor as they are all mixed together now - remember the second drawing we looked at earlier? One of the arguments that has been used, and I will admit I have used it, is that all of the energy in the circuit must be coming from those 3 batteries in the circuit and as long as there is only one path in or out, then all of the current must be flowing through that path. However, we may be making some large assumptions with that argument. First, consider that current must be flowing in the inductor during its ringing as shown in drawing 3 left diagram when switch B is open, but no current flows in the 'path' to and from the batteries. Next we need to consider open loop discharge. In this video I demonstrate that BEMF can be dumped through a single wire with sufficient current to light an LED and no conductive return path back to the coil that generates the BEMF. So this raises the question as to whether or not secondary currents can cause misreadings if they are allowed to discharge through our sensing resistor in some manner. When dealing with any new technology, or even when revisiting old technology that deals with proposed violations of known laws, it becomes very important to eliminate any possibilities that can skew the data or be taken the wrong way. This is especially true when the technology is difficult to reproduce and unable to be demonstrated by conventional means. I hope that in the coming posts we can devise some tests that will prove conclusively what the truth is surrounding this proposed technology. Whoa thanks a lot Harvey, good news guys i found a scope which we can get a good data dump will drop you guys an email ASAP, BTW here are some tips i received From Rose on reps if any one is building hope they help guys. Here's what's needed. The leads - the copper needs to be THICK. There must be NO CROCODILE CLIPS. Everything needs to be properly soldered. The lead between the battery and the resistor needs to be at least 2 feet long. Your potentiometer needs to be top quality. Then only can you get the right waveforms - I think? Ash, could you double check on the leads needing to be at least two feet long? Rosemary told me verbally that none of her leads were ever longer than 12 inches. But Glen's are quite a bit longer than two feet. The inductance of the lead wires definitely play a part in the observed waveforms. However, they also may be part of the reason that so many of our tests did not show the gains because that inductance is directly connected with the AC seen in the current sensing circuit. If you'll recall, I pushed to get probes that are specifically made for current but Rosemary stopped that cold by stating we had imposed on the good graces of our suppliers much too much already. I am convinced that the wire inductance is a large factor in why our battery voltage shows transitions from 24 volts down to 7 volts in the data dumps. I just don't think the batteries themselves are loading that far, it has to be a voltage drop across the wire impedance. If this is the desired effect she is looking for, then I suggest to keep the lead wires as short as is physically possible and simply add an inductive choke in series with them with a value engineered to produce the effect. At least that way you will be working with known values and the effects will be predictable and able to be easily simulated. BTW - this thread is currently not viewable by the public - I don't know who is in charge of correcting that. permissions and I can see it fine. the homepage along with all the other threads in the forum. I'll send you a screen shot in a PM showing what I mean - there is a problem. That person's screen shots were from the registration not being approved yet. I approved it so everything will be ok.
that did register but still have not been approved. Let me know if that is what is desired for this thread. I will have to check with her and see if it all works now. As I understand it, the forum should be visible for everyone. Persons who are experimenting with these circuits and wish to share their data and experiences here in this thread should contact FuzzyTomCat for authorization to post here. The objective is to keep things on target for advancing success in these areas of research and experimentation while leaving the debates and arguments to be done elsewhere. We are hopeful that this will inure an atmosphere of helpful collaboration and camaraderie with the fundamental understanding that what is shared here belongs to the public domain for the benefit of all. As such, it is understood that no single person or entity can take sole ownership implicitly or explicitly to the exclusion of others. Likewise, as public domain property, there is no prohibition to any person or entity using the information to full advantage within their power to do so. Anyone can contribute to the improvements and everyone can benefit from those improvements without the fear of having their contributions revoked or suppressed by a source IP holder. If someone owns the intellectual property to something and would like to have open source engineers develop it for them for free, this is NOT the place to do that. That should be done elsewhere and the details should be fully disclosed prior so that those parties involved know what is involved completely. Open Source is about full disclosure - and I think that is what this thread is about; truthful sharing of real research. We have a alternate method for a DYS made resistor that was designed by our forum member "b4FreeEnergy", a great way for those who do not have access to borosilicate glass tubing and a torch to round the sharp glass edges. b4FreeEnergy also indicates he will fill the "graduated cylinder" with a fluid and take his temperature readings from inside the cylinder. Hi Fuzzy what type of tape he used to that glass cylinder? 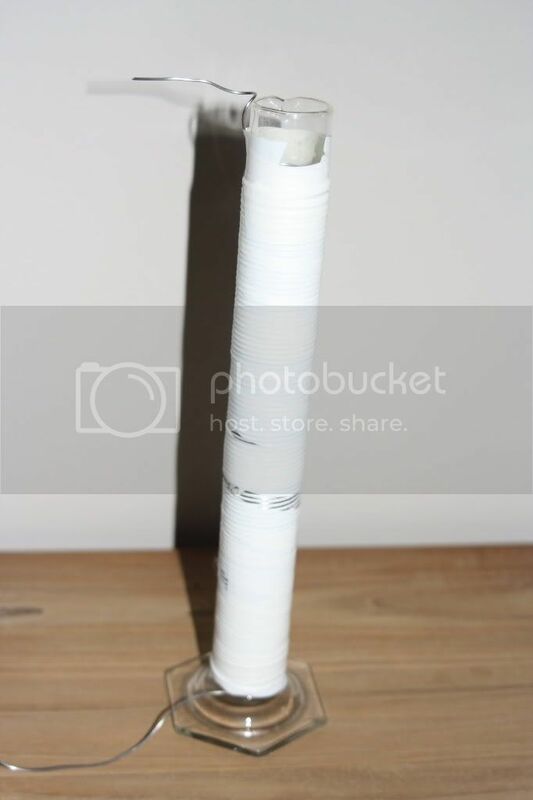 That looks like Telflon Plumbing tape but I could be mistaken. If it is, I doubt that it will work well as a heater above 327°C. This material is known as PTFE (polytetrafluoroethylene) and has a melting point of 327°C. But if all you are doing is replicating Glen's tests - then is should be ok as most of his stuff is well below that temperature. Today I wanted to analyze the Nichrome Power / Temperature curves to see what wire size really gives the best thermal profile against the power required to produce that temperature. We already knew that the smaller wire was able to produce vastly hotter outputs for much less current, but because the resistance of the wire goes up with the smaller gauge wire, it demands more voltage to push the current through that higher resistance. But the question was, how much voltage, or more importantly, how much power? And, that same site also gives us a resistance per length table for the same wire. If we know the amps and the resistance we can calculate the power easily with the I²R formula. You can see that AWG 11 requires much more power (281.21 Watts) than AWG 40 (8.52 Watts) to produce the same temperature of 2000°F. The resistance values are per foot and so this graph represents a single linear foot of each of those gauge wires. Also, it should be noted that the empirical data used to produce these charts was taken on tight coiled heating wires sprung to exactly twice the tight wound length. The arbor Diameter (rod Diameter used to wind the wire on) ranged from 1/32" for the smallest wires, 1/6" for the small wires, 1/8" for the medium wires and 3/16" for the larger wires. These shapes and sizes do play a small factor in the heat dissipation characteristics and were probably chosen to optimize the effect. Attached is the Excel Spreadsheet that I used to produce the chart with the tables included. IMPORTANT: You must save the file and remove the ".doc" from the end of it in order to view it in Excel. This is NOT a word document, but that is the only way I could attach it easily. Last edited by Harvey; 04-08-2010 at 02:23 AM. Hi Harvey interesting that you've posted regarding the gauge. Did anyone try modifications on the circuit for a bigger resistance heater? This information was brought to the attention of those involved early on but it was not accepted well by a specific person because it goes in the opposite direction of the predictions. I am currently testing a 7AWG low resistance 14µh coil to test for energy gains. According to the 'predictions' this big fat wire should dump copious amounts of energy into the system from the superluminous magnetic field, especially since none of the energy will be wasted thermally. Last edited by Harvey; 04-09-2010 at 08:56 PM. This is not even Teflon, it is ordinary tape. I used it to keep things in place because I did not have anything better at hand for the moment. The plan was to use that same silicone rubber Glen used but I don’t have it yet. Guys thanks so much for all this, all is in your PDF and will be up ASAP Finished our rep to send in for a good scope just about to send Harvey and Glen the snaps of the device, hope to get some measurements and publish back up results to support Harvey and Glen. Hi there, I did post this on Rosemary's thread as well but just in case not both threads are read by everybody, I'll post it again here. A little question about the 555 timer circuit. I’m trying to have that special ‘oscillation’ reproduced on my setup and while measuring I noticed that the 110R resistor gets rather hot. Is this intentional? Is there a special reason for having a rather high current through the setup circuits for the 555? Anyway the struggle continues, any remarks and or tips are welcome. It really isn't a big deal - but its a simple modification that removes one component, gives better adjustment and stops the discharge heating. Thanks for this extra information. I guess this should be enough variations and info now to have my setup 'oscillating'. I will give it another try during the weekend. I got a list of tips from Glen as well and something from Rosemary. If I shake all this together it simply has to work. I am looking for a 555 Circuit too right now. Something, what can increase frequency, but stay stable with the Duty cycle. A online Lession showed a simple Principle from the Timer. LM555. Scroll down a bit for the Block Diagram. When V-source is ie. 8 Volt, the Voltage is internal divided with the 3 Resistor to 6-4-2 Volts. Pin 2 (comp2) at 4 Volt Pin3 to low. but the Inverter turns the Output (Pin3) High, and the cycle starts again. The upper Resistor is there to dont make a short at the Discharge. and that what he labeled as Output Stage is the Inverter. Its an inverting Amplifier, and i dont know, if the LM555 has it, but the NE555 do. In this timer Circuit what is used, the Cap is better buffered and adjustable, more or less good. They are the same, so the inversion is in place for them all, but I did find some schematics with errors regarding this - but in practice, they do work the same. However, some are much faster, like the TLC version and some are lower power. So they have other properties that make them function different for certain applications - but the timing structure is always the same based on thirds. So they are very stable timing over a wide range of voltages - this is the most attractive feature of the 555 design. To get a stable duty cycle with variant frequency only requires one thing - a variable capacitor. Use your charge, discharge resistors to set the duty cycle and vary the cap for frequency. You will note that many engineers have added the diodes to give better control by splitting the charge and discharge sections. This is because typical applications use the same resistor to charge and discharge through and this is added in series with another on the charging which hampers easy adjustment of the duty cycle. So adding the diodes solves that problem allowing each side to function independently. You may notice that the 'Proposed Changes' schematic that I provided, keeps the discharge clamp - this ensures that the device truly completes the discharge cycle prior to recharging. However, it should be carefully observed that too little resistance on the charge circuit can allow the discharge transistor to drop the supply voltage and cause a reset condition. (something Aaron designed purposely by adding resistance to his negative dominant circuit supply line). The 555 is a very versatile chip with many variants - but a good understanding of how it works is critical in getting the desired results. After wasting most of the day yesterday dealing with timing errors in my Spice simulator and getting no where I decided to take a break from it today and catch up on some reading etc. Looking at the Temps we see that the resistor temp ranges from 130°F to 140°F. Now we see the average of those 11 readings as 137.55°F and the mode is split between 137°F and 138°F. we see this corresponds to ~7.1V @ 0.73A or 5.183W on average. Notice that the voltage divided by the amperage is less than 10 ohms at that temperature and is really about 9.73 Ohms. So we see the on period of our MOSFET is really a bit more, 57.32%. We are comparing small whole apples to big sliced apples (or even oranges for that matter). In other words, we have 7.1V @ 0.73A 100% (small whole apple) and we want to know how that relates to 24.77V @ ?? ?A 57.32% of the time. Now we need a leap of faith - we must believe that the resistance is the same in both cases, 9.73 Ohms - it may or may not be, but let's plug it in and find our current. 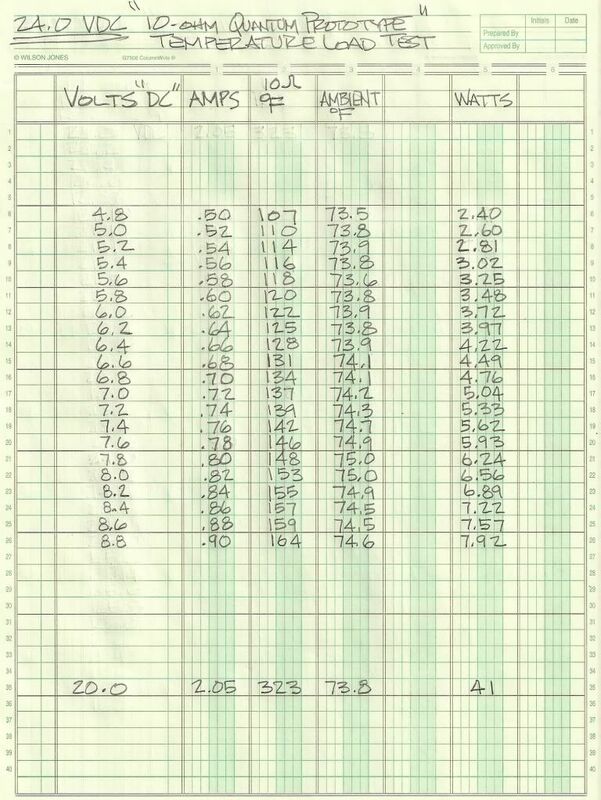 24.77V / 9.73 Ohms = 2.55A but wait, we have more resistance to add. The MOSFET is 2 ohms when on and the CSR is 0.25 Ohms - So the current is really 24.77V / (9.73 + 2 + 0.25) = 2.07A. But that is only 57.32% of the time. So the power is 2.07A² * 9.73 Ohms = 41.69W times 0.5732 (for the duty cycle) and we get 23.90W aperiodic operation. That is just a basic analysis - how could it be that we are getting such a low heat if we are consuming such great power? Something isn't right. Clearly, a DC analysis simply fails to give the correct answer. Remember the leap of faith? Did that set off any RED ALARMS? It should, because that is where the analysis breaks down. The resistor is more than a resistor, it is also an inductor and it has impedance relative to the frequency of operation. So it's true resistance to current flow is greater, and our current will be less accordingly. What is the real power being dissipated? How does a square wave affect the impedance of an inductor? If the resistor was non-inductive, would the frequency make any difference as long as the duty cycle remained constant? If I read between the lines here do you in fact mean that there is nothing to discover here and we’re wasting our time? It’s all based on interpretation and measurement errors? Measurements on those signals are indeed difficult; too bad we don’t have an easier test which involves less complicated measurements. So your setup is really in your cellar and you don’t look back anymore?